Sit back on the lawn and gaze off into the rolling waves. Take a dip in the pool with that warm Carolina sunshine overhead. Explore miles of uninterrupted beach in both directions. Hardwood floors and granite countertops provide families with a luxurious vacation rental. Grab a bite to eat or an afternoon treat at Scooby's Ice Cream & Grill. Kids will love playing old-school games at the resort's arcade. Head to the fitness center for a little cardio or weight training. You can walk along the sand to gorgeous Myrtle Beach State Park. Indoors, and next to a pool and spa, this lazy river is a great way to spend a rainy day or cool off in the summer. You're close to the restaurants, shops, and Skywheel at the boardwalk. The indoor pool allows you escape the cold while still having fun. 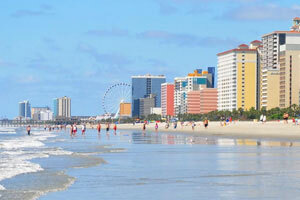 The beachfront Grand Atlantic Ocean Resort is a low-key resort located in Myrtle Beach. Stop by your condo to drop off your luggage – don’t bother unpacking, there will be plenty of time for that later! Change into swimsuits, grab goggles, pool toys and water wings. Spray everyone head to toe in sunscreen and get ready to hit the oceanfront outdoor pool. Little ones will enjoy the kiddie pool; it’s just their size! Work on your sun-kissed look on the oceanfront lawn. Don’t worry if the weather isn’t cooperating; there are plenty of indoor options: an indoor lazy river, heated pool and kiddie pool along with a hot tub. The central beach is just a few steps away from the pool area with soft, uninterrupted sands for miles in both directions. Kids will love the game room where they can play for hours. If you’re craving a little exercise, the fully equipped fitness center is a great place for a workout. But it's vacation after all and sometimes what you need is a treat. Head to Scooby’s Ice Cream & Grill for lunch, drinks, and frozen treats. Individually owned and decorated one- to three-bedroom oceanfront condos, many of which feature granite countertops and hardwood floors, sleep six to eight guests. A family field trip to Food Mart is definitely in order – your full kitchen won’t stock itself. Recruit the kids to help bake your famous double chocolate brownies (not that they’ll need convincing). Up for a low-key night in? TVs with DVD players have you covered. Bring favorite movies from home or browse the selection of DVD rentals available at the resort, pop some popcorn and call everyone into the living room for family movie night. Throw in a load of laundry while the movie is playing – that’s called multi-tasking. But wait, there’s more! All units are air conditioned and the resort has daily housekeeping, how great is that? The Grand Atlantic Ocean Resort is just a ten-minute drive to the SkyWheel. It’s almost two-hundred feet tall and has the best views of Myrtle Beach. Broadway at the Beach features a variety of shopping and dining options. Create your own unique piece of jewelry at Pick at Pearl, pick up a gift for your four-legged family member at Reigning Cats and Dogs or surprise the kids with a trip to Build-a-Bear. Treat yourself to a new pair of shades at Sunglass Hut. Hungry? Señor Frog's, Hard Rock Cafe and Joe’s Crab Shack are just a few of the many restaurants available at Broadway at the Beach. Ripley’s Aquarium features a 750,000-gallon shark tank, glass-bottomed boat rides and a stingray experience. The Children’s Museum of South Carolina has several interactive exhibits that allow children to learn and play at the same time. They can be a bank teller at The Big Bank, a contractor at Under Construction House, a Paleontologist at South Carolina Fossil House and learn about the scientific method while playing with water at Water Works. The hot tub is seasonal.